So you purchased a generic Standalone DVR, but didn't come with software? There are many standalone DVRs on the market, coming from just a few major manufacturers (generally in China). 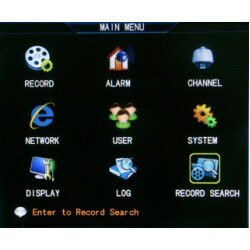 Often when you purchase a DVR, it may not come with the software and instructions needed to help you get the DVR online. Our Standalone DVR remote access software and instructions will work for many other brand DVRs, simply compare your menu screens with the menu screens shown below. If your screens match, then this software will most likely work for you. We cannot guarantee operation with any specific makes/models of DVRs because there may be some variations in the internal software. 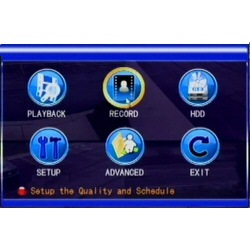 Phone software - Also included are download links for iPhone and Android software for connection to these same DVRs. The Android software is able to connect to multiple DVRs at the same time. If your DVR menu matches this one, then this software will most likely work for you to permit remote connection to your DVR. We have also included walk-through videos to help you setup the remote access on compatible DVRs. If your DVR menu is similar to this one, then this software will most likely work for you to permit remote viewing of your DVR. There are also walkthrough videos for this style of DVR, to help you get your DVR setup quickly and online in a flash. NOTE: We can in no way guarantee operation of this software with any specific standalone DVR, while it was designed for our own DVR-7004, DVR-7008, DVR-7016, DVR-8804RT, DVR-8808RT and DVR-8816RT model h.264 standalone DVRs, many of our customers have been able to use this same software on their H.264 Standalone DVRs that were purchased from other generic vendors with no software or instructions. Once software has been purchased, it cannot be returned for any reason. I got a DVR from Amazon and it had no software with it. found this download online through some videos on youtube. it worked exactly as it said.